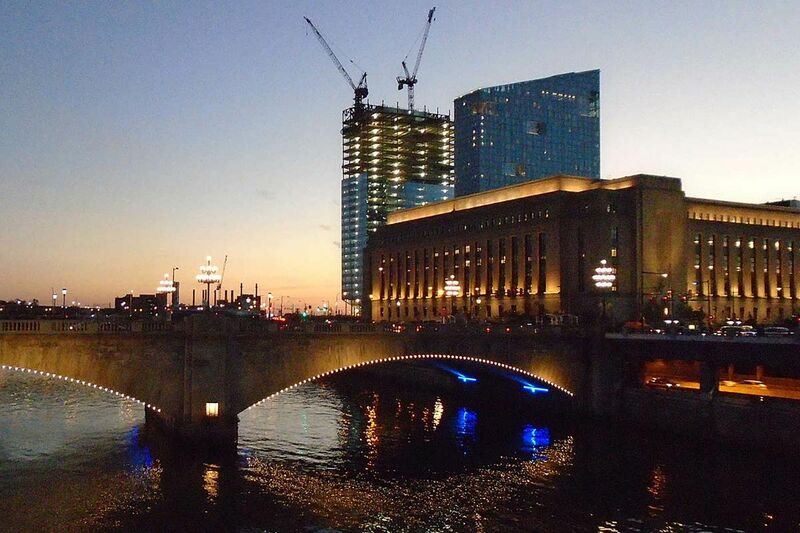 In its next move , the Philadelphia Stock Exchange will occupy three floors of the 49-story FMC Tower at Cira South on Walnut Street. Editor's Note: An earlier version of this story listed the wrong year for Nasdaq's acquisition of PHLX. The Philadelphia Stock Exchange, an occasionally mobile institution that has migrated among the Old Customs House, the First Bank of the United States, the Sofitel tower, and other landmarks since its 1791 founding at what is now City Tavern, plans to rise from beneath Market Street. The next move - from its 34-year home at 1900 Market St. to three floors of the 49-story FMC Tower at Cira South at 2929 Walnut - fits the market's growing role in the business of trading stock-options contracts, which investors use to bet on whether a stock will rise or fall. To be sure, as an employer, the Philadelphia exchange (PHLX), now a unit of Nasdaq Inc., is smaller than it used to be, with 140 staff and about 80 market-makers, brokers, and specialists on its shrunken trading floor on a given day, down from hundreds of staff and 505 trading members in the early 2000s. But that's true for old-style exchanges everywhere. As securities trading has moved online, serving global customers at remote locations, the PHLX's last regional-exchange peers, in Boston and San Francisco, have shut down. The mighty New York Stock Exchange is a subdued remnant of its old self. Yet the PHLX, the nation's oldest securities market, endures. Nasdaq made veteran PHLX software developer Thomas A. Wittman's tech team the core of its expanded options business when it bought the exchange for $652 million in 2008. Once the options industry's smallest player, it is now the largest, by trading volume, of the 14 stock-options trading platforms tracked by Chicago-based Options Clearing Corp. The PHLX handles nearly 20 percent of the industry's total volume of about 12.5 million contracts a day. As a group, the options markets that Nasdaq bases here - including the International, Nasdaq, and two smaller exchanges, as well as the PHLX, all under the leadership of Wittman, Nasdaq's executive vice president in the Global Trading & Market Services division - now lead the industry, with 40 percent of the market. That's ahead of the 33 percent market share for the CBOE, BATS, and two smaller affiliated options markets in Chicago, and the 19 percent controlled by the New York Stock Exchange's AMEX and ARCA markets. The rest is split between the Princeton-based MIAX market and the Toronto Stock Exchange's options group. "We competed, and we're now larger than New York or Chicago," Wittman, a 29-year PHLX veteran, told me. In a vote of confidence, Nasdaq is moving the Philadelphia trading, management, and software development center from Market Street, with its windowless underground trading floor, stacked terminals and wiring bundles, to the sixth, seventh, and eighth floors of the 49-story Cira South office and apartment tower at 2929 Walnut, also home to FMC Corp. The space is being designed by Philadelphia-based HOK, whose interiors director, Lorraine Fisher, promises the tech-forward site will "evoke the rich history" of the first U.S. securities exchange. Both the old and new sites are owned by Brandywine Realty Trust. "We're glad our office inventory could accommodate them and keep Nasdaq in Philadelphia," Brandywine chief Jerry Sweeney told me. The site is in a Keystone Opportunity Zone, giving Nasdaq a sales-tax exemption on site materials, plus other tax breaks if it expands, said state spokesman David Misner. At Cira South, the PHLX will continue to operate a physical options trading area, Wittman said. The PHLX floor has been an incubator for Philadelphia investment companies, including Susquehanna International Group, headed by Jeff Yass and other ex-PHLX traders who run a multinational firm with more than 1,600 employees. Though the new 75,000-square-foot home is about the same size as the current Market Street space, "it's a lot more modern," said Wittman. "High-tech cubicles. Modern technology. Sunlight goes through the building." No more traders craning toward banks of bolted-on terminals. They'll use handheld devices and adjustable desks. Wall art will show the old Merchants Coffee House, the market's first home (today's City Tavern). There'll be a modern coffee shop, too. Wittman said Nasdaq has found the city a tech-talent-rich, cost-effective base for the business, a good place to grow again. "We have a really great cross-section of job opportunities," he told me. "Tech jobs. Regulatory jobs. Client service. Everyone should know that Nasdaq, which is a major, global tech company, has a big footprint in Philadelphia." What of stock markets' original job, raising capital for new companies? Options markets like PHLX trade in existing companies' securities. It's expensive to list as a new firm on the Nasdaq or New York markets. There has been a small movement in recent years to resurrect regional exchanges, in hopes of spurring small-business fund-raising. A group including former PHLX official John Wallace persuaded New Castle County Executive Tom Gordon last year to lend it $3 million to start a Delaware Board of Trade (DBOT) for "emerging" companies, in hopes it would create trading jobs in Wilmington. That sounded to me like a long shot, as I wrote in this space at the time. DBOT failed to open on schedule this summer, Wallace and other promoters haven't been returning phone calls, and the delay became an issue for Gordon's opponents in his reelection bid. He was voted out of office in Delaware's Democratic primary Sept. 13.